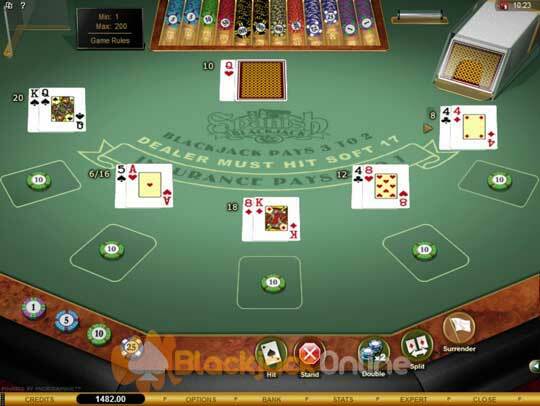 The Spanish Blackjack game is another of the readily available card games found in all online casinos which utilize Microgaming software. This game boasts a special set of payouts in addition to the standard ones found on all Blackjack games. Whilst you may opt to play it, be aware that the house edge on this game, when you are playing it with perfect strategy is 0.38%, and as such Microgaming do offer some better Blackjack variants boasting much lower house edges than that! To enable you to play this Spanish Blackjack game perfectly then make sure you get your own copy of our Spanish Blackjack Strategy Card (see below) which is free to download, and shows you every single move to make when playing this Blackjack variant. When to Surrender a Hand - Do not make the mistake of surrendering your hand at the wrong time. The only time surrendering a hand is the correct strategic move to make is when you have been dealt a pair of 8’s or either a hard 16 or 17 when the dealer is showing an Ace. Playing a Soft 15 - You should always double down when you have been dealt a soft 15 unless the dealer has a 2 or 3 card showing or a 7 to Ace card showing. If he has then make sure you hit that particular hand. Splitting Aces - You should always split every single pair of Aces you are dealt, irrespective of what the dealers up facing card is. Playing a Hard 13 Hand - Many players consider 13 to be unlucky, and often they will struggle when they have been dealt a hard 13 hard, unsure of how to play it. Just remember the correct move to make is to always hit these hard 13 hands, no matter what the dealers up card is showing. Dealer Rules - The shoe is made up of eight Spanish decks of playing cards which means all of the Ten cards have been removed. If the dealer has been dealt a hand containing a soft 17 valued hand or lower then he will hit those hands. 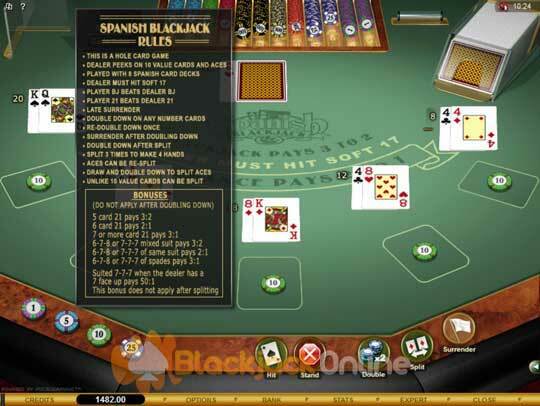 Player Rules - As a player when you are playing Spanish Blackjack you can Double Down on any number of cards, and can re-double down once, and double down after splitting a hand. Surrender is available even after doubling down a hand. Aces can be split and also you can draw or double down to split aces, and also re-split Aces. Payouts - The standard payouts are 3 to 2 for a winning Blackjack ranked hand, all other hands pay out at even money bar the Insurance wager, and when you have placed this wager, and it wins, then you get a payout of 2 to 1. A range of additional winning payouts are awarded when certain hands have been dealt, the best paying one is when the dealers up card is a 7 and your first three cards dealt is a set of suited 7 cards, this hand gives you a payout of 50 to 1. No bonus payouts are awarded when you have doubled down a hand.